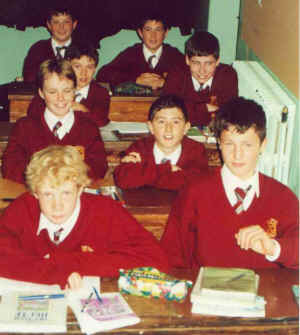 Michael O' Brien (Classmate), Wexford, Ireland. As said on this website before, Gary was special, even though I knew him little under two years this was quiet obvious, he had a special interest in football as he brought a folder into St. Peters which he showed me, in this he had so much information about every club in England, it didn't matter what division the club was in, Gary had all the facts. Gary also took questions out of this football folder he had put together and asked a few of us, in a sort of quiz at the first break. Gary always had to be the quizmaster of course because none of us would have a chance if he could answer. Gary also had a great love for languages as he was by far top of the German class, half fluent in the language after not even two years. He had also taken up other languages outside of school and knew about seven different languages reasonably well. Although there was one subject which he couldn't understand, this was Tech. Graphics a subject which he dreaded. However he made up for this in all of the other subjects. The Following is A Tribute From Gary's Classmates of 3A3. The whole class of 3A3 misses Gary. He helped create a more productive atmosphere in the class, especially in German. He was definitely the best person in the class at it. If you were stuck with a word or sentence Gary would always know the answer. He would prefer to help you figure out the sentence yourself than just tell you he also would prefer just to tell you rather than let you get into trouble with the German teacher. He thought if you worked it out for yourself you would learn it better. Not only was he the best in the class at German, he was one of the best in nearly all of our other subjects as well. He had a special flair for languages. He always had his head stuck in a "Teach Yourself French or Spanish" book he really loved languages and wanted to be a language interpreter when he left school. He always liked to try new things and overcome new challenges. He ran his own little soccer league, took part in Tae-Kwon-Do, and even ran his own radio station for a while. He had great courage to stand up to the bully's in the class. He never backed down in an argument. He fought for what he believed in but never with his fists. He fought with words, knowledge and information. He always spoke his mind, even when his thoughts were not the most popular. He always stood up for what he believed in. He had a passion for soccer. He knew ALL THE FACTS AND FIGURES, no matter how small or unimportant. He supported Tottenham Hotspurs F.C. in first year but two students in our class take credit for changing his support to Liverpool F.C. He was very interested and very good at Tae-Kwon-Do. He was only two "belts" away from a black belt when he died. He also was fairly good at athletics. He was a quiet enough chap but he was never too quiet to ask questions in class. He had great ambitions and we don't think he would have let anything stop him achieving these. He was a hardworking, friendly and decent chap and we all miss him and always will. Angels are our only peace of mind. St. Peter's College Gary in the middle (arms folded) of his school mates 1A2 September 1997.